Working in small market television is a strange and wonderful experience filled with weird and amazing things that most people may be surprised to hear about. 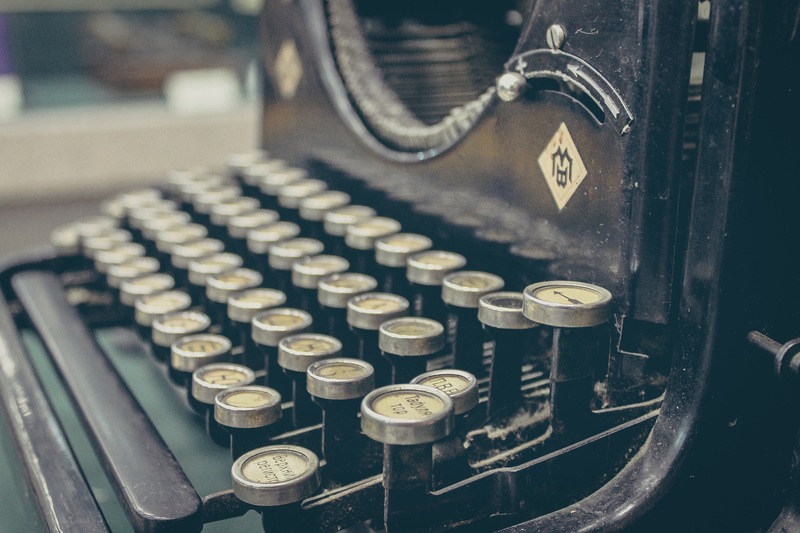 The flutter of phone calls reporting first robin sighting each spring…the UFO sightings around the full moon (I kid you not)…I will gladly be sharing some of these stories as we go along. But first, as promised……Did I ever tell you about the time I was a giant pickle? Sitting in the convertible was a challenge. It pushed the air holes to the top of my head making it hard to breathe. 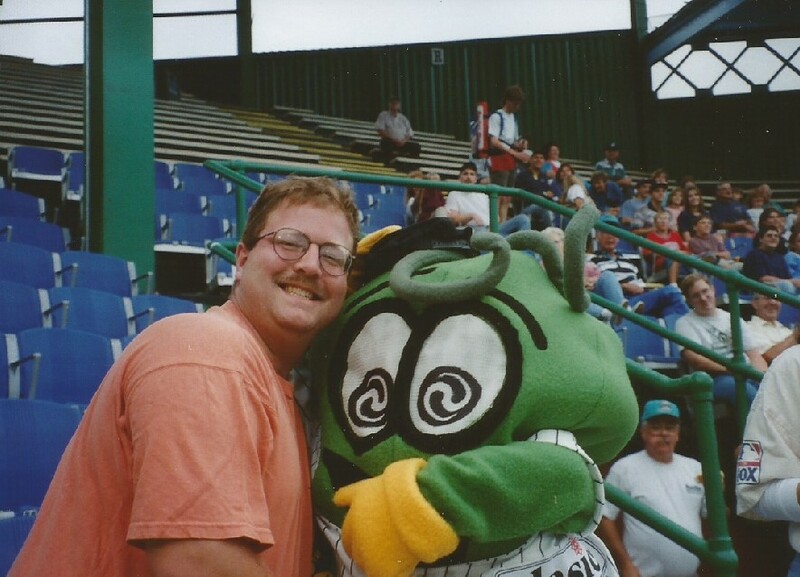 I was working at WWCP-FOX 8 in Johnstown, Pennsylvania when I found about the chance to become a pickle mascot. It wasn’t my grand plan or something, the opportunity presented itself and I seized the gherkin. I started full-time in Production Department during my last semester in college and worked my way up from Technical Director to Promotions Producer. 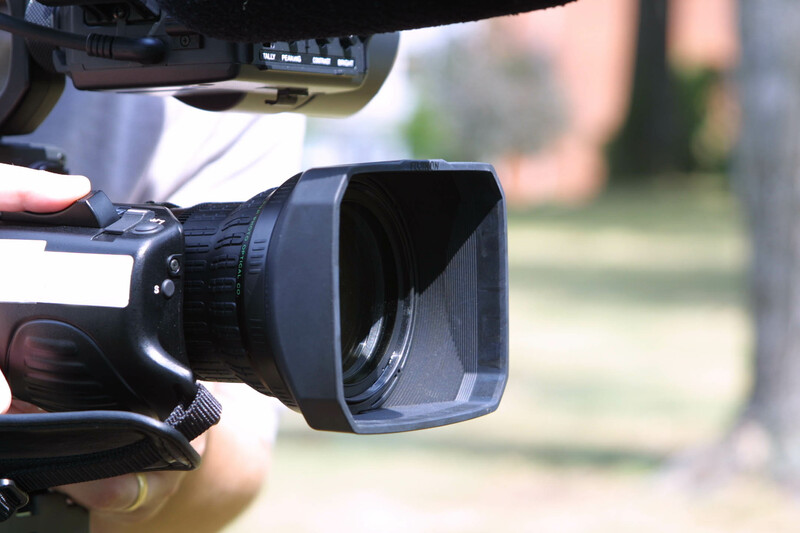 It was a fancy way of saying I worked the 4AM to 1 PM (but usually it was when I could finally get out of there for the day) doing morning news cut-ins and any promos (the commercials for TV shows) or promotional videos that needed edited or produced. I took promo feeds and checked faxes for changes to schedules, helped come up with ideas for local campaigns, etc. It was on one of the national feeds for a Fox Sports Kids’ show we aired called In The Zone (followed by a fax a few days later) that I saw about a marketing campaign they were going to try to create a new mascot call the In the Zone In A Pickle Pickle. 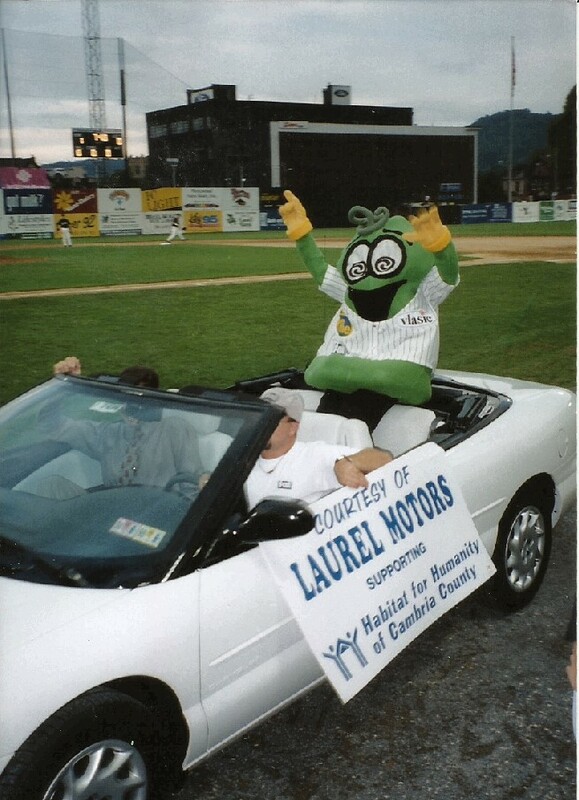 They were only going to let 20 or 25 affiliates have the first test mascots so we had to act fast if we were going to get in on the ground floor of this thing. Our Promotions Director wasn’t too sure about it, especially when she realized that the only employee at the station that met the 5′ to 5’4″ requirement was me. Having only one person who fit in the costume could limit the number appearances and would prevent me from getting a break when we were out places. Thankfully I was volunteering with some very willing (i.e. gullible) high school students who just turned 18 and volunteered to be Jr. Pickle People! 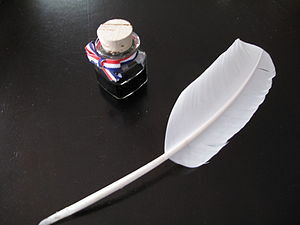 We faxed off the form and were selected as a test market. 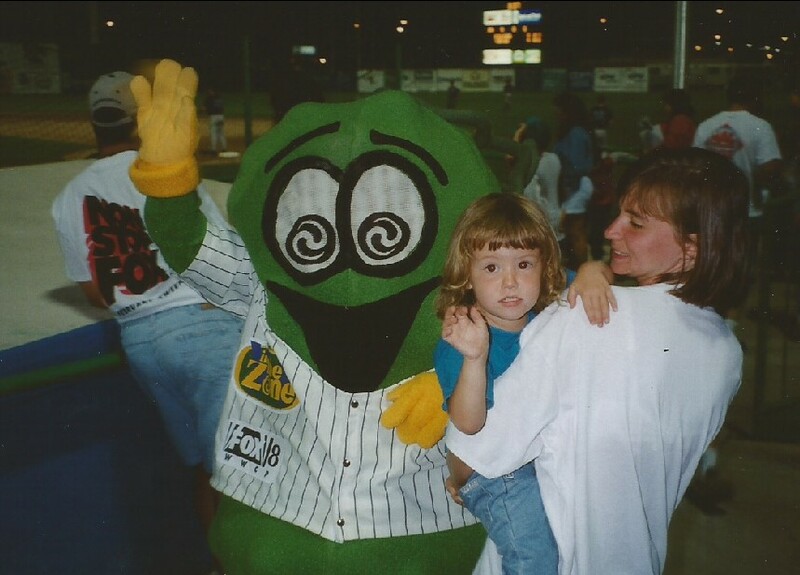 Our Pickle debut was at Mascot Night for the (now defunct) local pro baseball team, the Johnstown Johnnies (whose own mascot was a giant baseball head…thing…think sort of the Headless Horseman only in a baseball uniform and with a giant baseball with a head instead of a pumpkin)***. It was in the 80’s and about 70% humidity. Perfect night to be wearing a felt and foam suit with Lycra pants. I was joined by the star of the evening, the Pittsburgh Pirate Parrot, who turned to be out a really cool guy, as well as the walking teddy from a local hospital and a couple of other regional mascots. 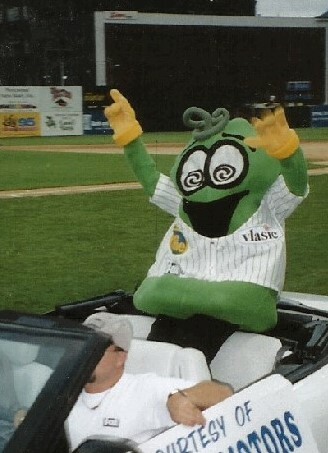 Since our station was one of the sponsors I got to ride around the track in a white convertible driven by Chris, my official “Pickle Wrangler” and body-guard for the night. I thought I might get to cool off, but when I sat down it pushed the air vents over my head and I almost passed out. On the plus side both the Pittsburgh Parrot and I got to throw out the first pitch. Between the giant three finger felt gloves and the fact that I couldn’t move my arms all that well and when I moved my arms past my shoulders I couldn’t see out the eye holes anymore (and lost sight of the catcher) let’s just say the ball did not reach the plate and leave it at that. We had big introductions of all the mascots between the 1st and 2nd innings so we had to wait under the home dugout for our big moment. The Parrot was on stilts, like you do for special occasions, leaning over the top of the vending machine. I was dressed as a giant pickle and was leaning against the wall. The Giant Baseball Head Guy kept pour drinks down through the gaping hole in his mouth. The life-size Teddy Bear was leaning against the other wall. We were talking about 401(k) versus IRA investments…with the large talking bird giving some really great advice when the “Pickle Wranger” burst out laughing and doubled over. “This is the strangest conversation I have been a part of in my entire life.” The four of us looked around and shrugged. The Parrot saying that this was one of the more normal things he’s done. The Pittsburgh Pirate Parrot tried to give me a hug but I ended up falling over. You can see him trying to escape the kids rushing to help the “Green M&M” back up. I actually had a great time with the Parrot. We got along great and interacted with each other in the stands. He came over to give me a hug at one point and neither one of us realized how top heavy my costume was. Until I lost my balance. I heard him say. “Just relax, I’ll put you down.” I knew I was well padded so I just went with it and the next thing I knew I was looking at the sky. A bunch of kids had surrounded us by that time and started yelling at the poor guy for tackling the green M&M. Then the kids tried to help me up, yeah that didn’t go well. Pickle Wrangler Chris to the rescue. The big problem with the costume was that it didn’t necessarily look like a pickle. It was big. It was green. It was bumpy. Most the bumps were covered by the baseball jersey. And the stem at the top didn’t look all that stem like. Most people really did think I was a giant green M&M, peanut to be specific. I was also called a jelly bean. And a pepper. No one guessed pickle. 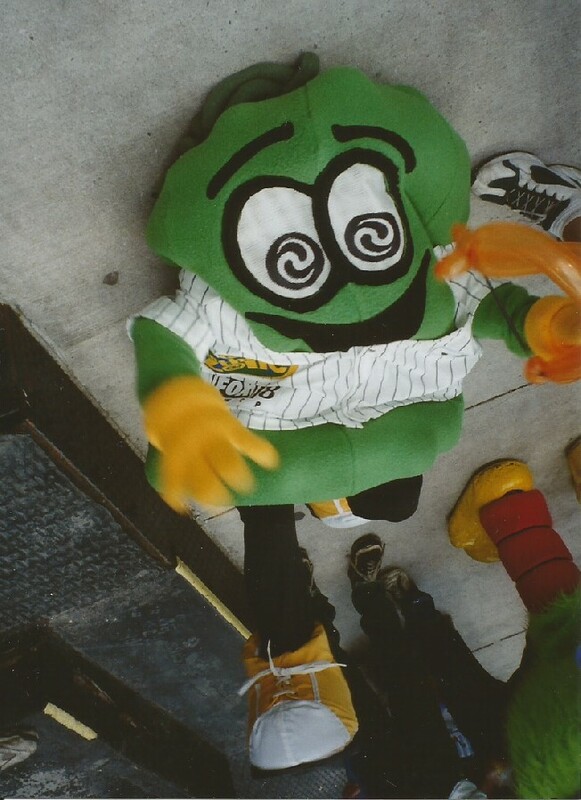 The pickle wasn’t as scary as some of the other mascots (I’m looking at you Big Baseball Head Guy!) and since most people thought he was candy he was pretty well accepted. Well by everyone but my niece who decided The Pickle was the Spawn of Satan. But The Pickle could not be denied and she warmed up to him. Only my niece seemed convinced that The Pickle was evil. I think I lost close to 10 pounds by the time the night was over. 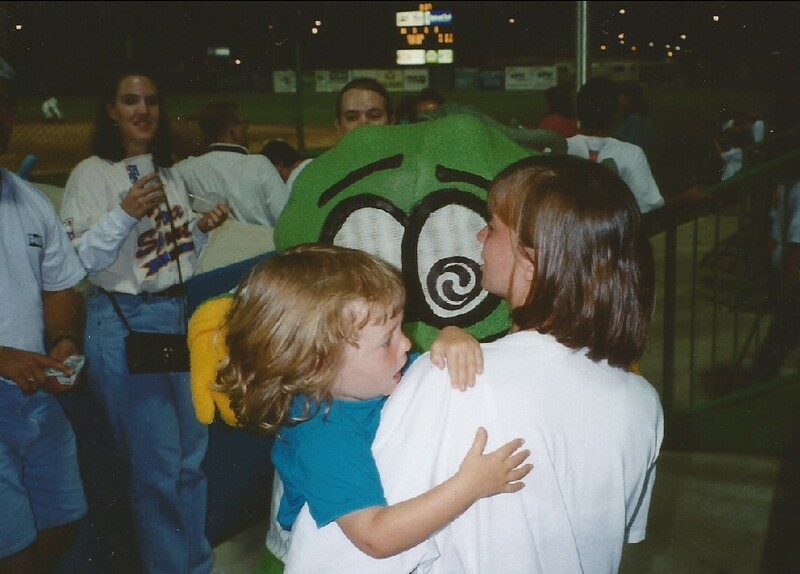 When I finally took a break out of the costume and slipped into the stands somewhere in the 6th or 7th inning the Parrot spotted me and attacked my husband and I with a super soaker. When we were in the dressing room talking I mentioned that I had recently gotten married and he said he wife came with him, so after he soaked us he went and sprayed a woman who looked like she was going to kill him and then pointed at himself. I gave him a thumbs up and told my husband it must be the Parrots wife. Again…strange conversations you don’t expect to have at the ball park. I doubt my husband saw this coming we got married a few months earlier. The Jr Pickles took over most pickle duties and I was the wrangler after that. We did a blood drive or two. But the whole In the Zone In A Pickle test period was really only about six weeks, so we didn’t get to do all that much. By the next summer I wasn’t at the station any more and I never heard another word about The Pickle. ***I’ve searched for a picture of the Johnnies mascot but couldn’t find one. If anyone out there has a picture, or a link to one, I would LOVE to include it. Please share it in the comments section below!! Thanks! I’d also love to hear from anyone who was ever a Pickle or involved in the project! Leave a message below! Seeing that this week is San Diego Comic-Con, and I took my girls to their first con a few weeks ago, I’ve got cons on the brain. Did I ever tell you about my con experiences? Tune in next time!